The Week Ahead – Cross Stitch Madness! I’ve finally prepared my series of cross stitched Christmas cards and I’ve been listing them in my Etsy shop. Yep, I know it’s June but these cards are hand stitched to order so I might as well have them ready for the super organised amongst you! Some feature single toned threads whilst others use hand dyed variegated threads which add another element to these designs. I looked at Fair Isle for my inspiration and these patterns have been adapted from photos of traditional knitted sweaters I found online. I think there is something sweet about the simplicity of these designs and they are perfect for giving to friends or family. 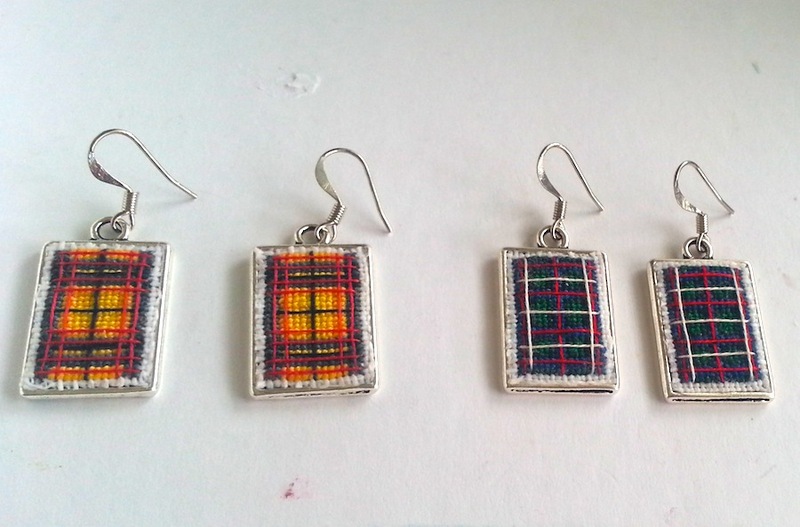 This week I will be sticking with my cross stitch, but working on more tartan earring designs. Keep you eyes peeled for these little works of art coming soon! My Etsy Love series is back for a one off chat to Dmytro and Iuliia from Dream Papercut who sell handmade papercuts and greetings cards. Their papercuts are so intricate, it is obvious that a lot of care and attention goes into each piece. Dmytro and Iuliia make a wonderful job of reinforcing the true nature of handmade! Our names are Dmytro and Iuliia and we live in Ukraine. We create hand-cut paper silhouettes inspired by nature, life and people who like our works. Paper cuts are made from a single sheet of paper and all of the pieces are interconnected. All paper cuts in our shop are favorites for us. Paper cutting is an amazing process, when at the beginning you just see a piece of paper and after spending several hours/days to cut, paper becomes a beautiful work of art. Silhouettes for us are not just a sheet of paper. We put love, care, kindness and happiness into our work and truly believe that people can feel the same emotions looking at our paper cuts. The biggest milestone we have achieved was creating a shop that can stand out from the huge amount of beautiful, unique, creative shops that are on Etsy. The main our goal is to make more and more people happier through our work and pass on a little part of our love and soul. Our plan for the future is growth. We want to create more beautiful and intricate paper cuts and get more customers and followers of our art. Thank you Dmytro and Iuliia for sharing your wonderful shop with us. I wish you the best of luck with expanding your range of beautiful hand crafted papercuts – you must have so much patience to create these intricate pieces and I know that your hard work will pay off.